RALEIGH, N.C. (AP) — Technology giants Apple, Google and Facebook are among a dozen big companies or their top executives objecting to a North Carolina law that bars municipalities from adopting their own anti-discrimination ordinances. San Francisco's mayor on Friday banned city workers from non-essential travel to North Carolina. The city, which has a large gay and lesbian population, "will not subsidize legally sanctioned discrimination," Mayor Ed Lee said in a statement. The Charlotte ordinance would have enabled transgender people to legally use restrooms aligned with their gender identity, and would have provided broad protections against discrimination in public accommodations in the state's largest city. 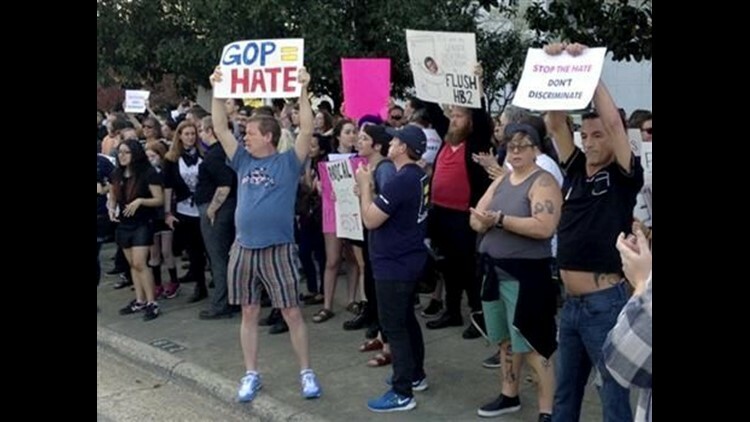 Corporations announcing their displeasure "are shamefully bullying" state officials while many small business owners who live in North Carolina support the new legislation, North Carolina Values Coalition Executive Director Tami Fitzgerald said. "North Carolinians should be aware of this so they have the opportunities to be consumers of companies that are congruent with their values," Fitzgerald said in a statement. Other businesses have voiced support for the measure Republican Gov. Pat McCrory signed into law, a spokesman for his re-election campaign said. Spokesman Ricky Diaz did not respond when asked which businesses backed the governor's decision. Attorney General Roy Cooper, a Democrat challenging McCrory this fall, opposes the law. He said Friday he's worried actions by the GOP-led legislature and the governor could harm the state's chances to land or keep sporting events such as the NCAA basketball tournament and the NBA All-Star Game in Charlotte in 2017. Both organizations released statements about the law on Thursday, but stopped short of saying they would not hold the events in the city. "Not only is it wrong to discriminate, but we should not be putting our economy in jeopardy," Cooper told 99.9 The Fan, a Raleigh-area radio station, calling the actions creating the law "a national embarrassment." McCrory and his allies have blamed Cooper for failing to intervene before the General Assembly did to stop Charlotte's ordinance. McCrory said Thursday that Cooper has "lost touch" with the privacy norms the public expects while using a restroom or locker room.